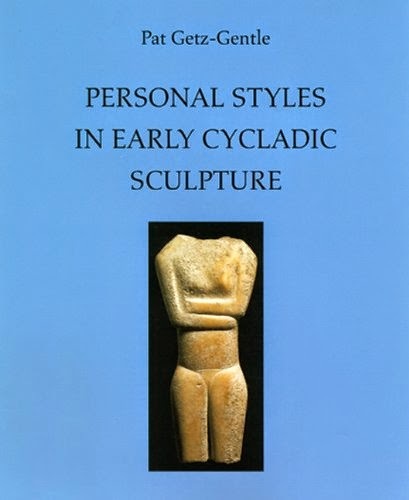 My review of the (slightly) revised edition of Pat Getz-Gentle's Personal Styles in Early Cycladic Sculpture. Wisconsin Studies in Classics (Madison: The University of Wisconsin Press, 2013) has now appeared on BMCR. I consider some of the intellectual issues surrounding this category of material and discuss some of the figures appearing on the market. I remake the case for using the term "Keros Haul" (rather than "hoard") for the fragmentary Cycladic figures. It is unnecessary to revisit some of the concerns about reconstructing artistic personalities in the third millennium BC. The progression of style is unsupported by any evidence, and relies more on the art historian's perception of how the corpus should be ordered.